If your pet has been looking a little too happily fed lately, a good New Year’s resolution might be to help them get in better shape! 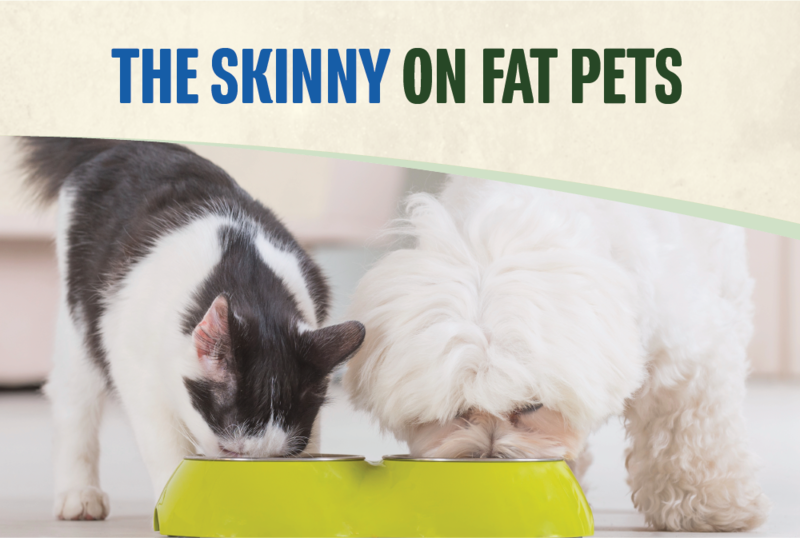 Overweight pets have a higher risk of developing diabetes, arthritis, heart disease, high blood pressure and certain forms of cancer, and helping them slim down is easier than you think. Weight loss is 80% about diet and 20% about exercise. Measure the amount you feed your pet every day and feed meals rather than leaving food out for free choice grazing. Watch those treats. Pets love a good snack, but many treats are high in sugars and fats. For canines, instead of treats, give them baby carrots, celery, cucumbers, and ice cubes. For cats, opt for a dental chew (in limited amounts). Exercise more. Dogs of course love to go on walks, so take them out for a jog or a stroll 30 minutes a day for at least three to four days a week. Cats can get their exercise by playing indoor games like chasing a toy or feather for around 20 minutes a day. Get everyone involved. Whether you live with a partner, roommate or kids, keeping your household aligned with the same goal of helping your pet stay healthy will make things easier, as everyone can participate in the same exercise/play and healthy treat routines. Consult with your veterinarian. Vets are experts when it comes to pet nutrition and care, and our vets can consult with you on a plan to help your pet shed those extra pounds to become happier and healthier! Don’t forget about those kitties either! Indoor cats are especially susceptible to weight gain that an owner may not notice right away. Simply changing your cat’s diet without increasing physical activity will have little effect on their body weight. Most cats enjoy interactive play so encourage them to exercise with dedicated one-on-one playtime. Throw their favorite toy, use a laser pointer, pull out a rod and feather bouncer or even get high-tech with automated cat toys! Chasing and batting is great exercise for your cat and fun for you. It’s not difficult to help your pet stay in shape, however, it does take time, commitment and patience. You may not notice results right away but being consistent is key. For more information on how to help your pet get in better shape, contact us today (713) 659-0650.